bühler & partner architects | engineers | consultants is an architect Marbella, and already 10 years before the entry into force of the “Código Técnico de Edificación (CTE)”, they realized the quality defined in this building law of 2008. We, as an architect in Marbella, besides the top design and top quality, we are also interested to work with integrated people, sophisticated house technology and recycling facilities (water, solar, roof gardens, noise protection, energy consulting, etc.). As a gardening enthusiast, the architect in Marbella is particularly committed to the execution of wonderful Mediterranean gardens, without which a beautiful house is not so beautiful. As a carpenter, Benno always has the necessary reference to the construction site and reality, he is certainly not afraid to make the shoes dirty on the construction site! As a practitioner, Benno is very happy to be on the construction site and is looking for the realization of the planned work to be exact. The office was founded in 1996 by Benno Bühler (architect reg. 574 en el COA Málaga) and has been active since then mainly on the Costa del Sol and Costa de la Luz. From the beginning, bühler & partner architects | engineers | consultants execute with high-quality design and top quality. bühler & partner architects | engineers | consultants. We work together with Spanish architects, structural engeneers, lawyers of German-Spanish law firms. As an architect in Marbella, we carry out projects on the Costa del Sol and Costa de la Luz, from Sotogrande to Nerja, from Tarifa to Cadiz. Since 2005, we have also been working on the Bulgarian Black Sea coast, where we already have the building permit for a project (95 units) in Byala and another with 191 units next, both with a spa, various pools, shops and offices and large open spaces. We are currently working in Varna (Black Sea Coast) on a project with about 250 residential units, construction is expected to start in 2010. On our website (www.bbArquitec.net or https://architect-spain.com), we will be able to inform you about us, to visit one of the interesting links and to get to know the country of Andalusia. We invite you to look around here. With our online guide (in german www.haus-bauen.net or the spanish version http://construir-una-casa.com), we inform house builders online about the entire course of a construction site, including tips and tricks for building, by the architect Marbella. 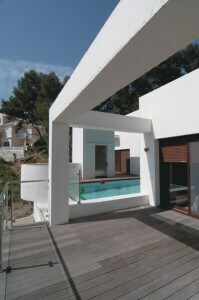 On our blog, we will inform you about the latest developments in architecture on the Costa del Sol. As a consultant we are happy to advise you and use our specific knowledge as an architect in Marbella, the Costa del Sol and the Costa de la Luz. Like every investment, this is only successful if the yield is right! Ask us about investing in Spain’s coasts, and especially ask for a small purchase report before you buy. A small investment in an expert opinion may avoid to suffer a later loss because of missing documentation, gross defects in the construction, or even a plot which is advertised as building land and is in fact arable land. We would be delighted to cooperate with you!